Who are we Indians ? Where did we come from ? Many of us believe our ancestors have lived in South Asia since 'time immemorial'. But, as it turns out, 'time immemorial' may not have been all that long ago. To tell us the story of our ancestry, journalist Tony Joseph goes 65,000 years into the past—when a band of modern humans, or Homo sapiens, first made their way from Africa into the Indian subcontinent. Citing recent DNA evidence, he traces the subsequent large migrations of modern humans into India—of agriculturalists from Iran between 7000 and 3000 BCE and pastoralists from the Central Asian Steppe between 2000 and 1000 BCE, among others. As Joseph unravels our history using the results of genetic and other research, he takes head-on some of the most controversial and uncomfortable questions of Indian history: Who were the Harappans? Did the 'Aryans' really migrate to India? Are North Indians genetically different from South Indians? And are the various castes genetically distinct groups? This book relies heavily on path-breaking DNA research of recent years. But it also presents earlier archaeological and linguistic evidence—all in an entertaining and highly readable manner. A hugely significant book, Early Indians authoritatively and bravely puts to rest several ugly debates on the ancestry of modern Indians. 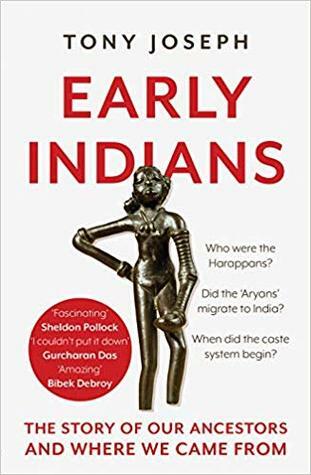 It not only shows us how the modern Indian population came to be composed as it is, but also reveals an undeniable and important truth about who we are: we are all migrants. And we are all mixed.